The feast day of Saint John the Baptist is celebrated with events in many parts of Italy and in many parts of the Christian world from Lithuania to Brazil. He was the first apostle of Christ and the only saint whose birth is celebrated instead of his death. On June 23 people gather to celebrate a midsummer eve, the longest night of the year with bonfire, music, parades in period costumes, special street markets, craft, fireworks, drinking and eating. 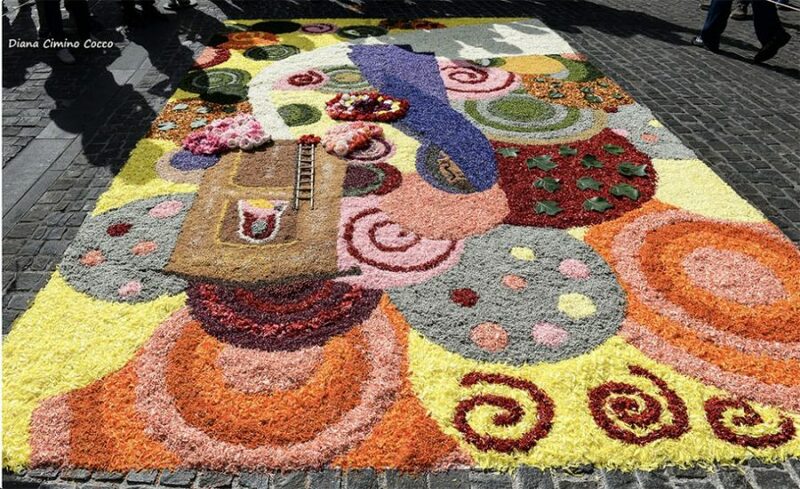 In the Marche region of central Italy the feast culminates in the “Infiorata” a carpet of flowers all over the town. Particularly in Florence St. John feast has been observed since the medieval time with a 3-day celebrations of street expressions. One of the many activities for women is collecting herbs, some of which have medicinal properties, such as fennel, rue, rosemary, lemon verbena, mallows, laburnum, foxgloves and elder flowers. According to an ancient believe, on Saint John’s night evil spirits and witches fly around, herbs are hung on entry doors and tall bonfire with a made up witch on top will keep the evil spirit away. In the south of Italy the specialty of this day is “Vermicelli alla San Giuannidd” (Vermicelli Pasta St.John’s Style), one of the typical dish of Puglia. Fine chop the cloves of garlic and crack open the cherry tomatoes. In olive oil sauté garlic, capers and anchovies until anchovies are almost crumbled. Add cherry tomatoes. Some people add olives too. Season with salt to your liking. In another pot bring salted water to a boil to cook the vermicelli pasta al dente. Drain the water of the pasta, but reserve 1 cup of the cooking water to dilute the sauce if it is too dry for your taste. Mix the cooked pasta with the sauce and toss it well. Sprinkle a small amount of Pecorino cheese. Add a swirl of olive oil and it’s ready. The anchovies will disappear, but a tasty flavor will remain. Yum on the pasta. I love anchovy’s. .
Hi Sindy, it’s a very simple, but tasty recipe.